Perfectly crispy on the outside, soft and creamy on the inside and just the right amount of spice — the recipe below is something I make often because it's delicious and, honestly, something I crave a lot. Sometimes I even leave the potatoes in the oven a little longer so they get super crispy! 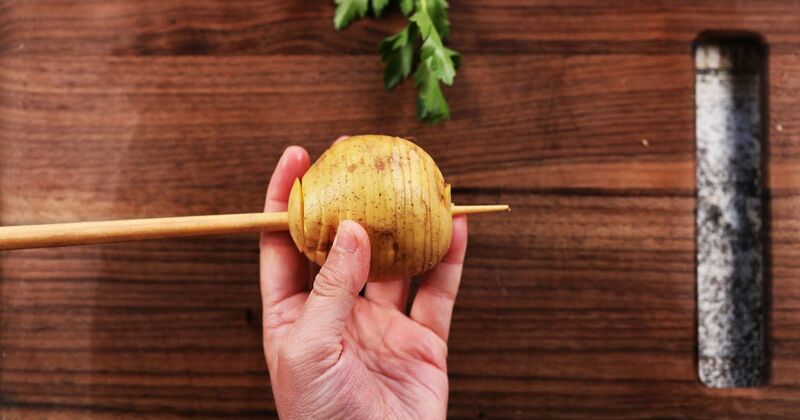 I start by inserting a sturdy chopstick into the bottom of the potato all the way through the top. Then I cut from the top in a spiral using the chopstick as a guide, spiral-cutting all the way down to the bottom. I carefully remove the potato from the chopstick to avoid having to put the chopstick in the oven. Just spread out the layers of the spiraled potatoes on a baking sheet. Slather on butter, salt, pepper and a sprinkling of Parmesan cheese mixed with spices, and 45 minutes later you'll have the perfect vegetarian snack! Insert chopstick into the bottom of the potato, going all the way through lengthwise. Starting from the top, cut a spiral, using the chopstick as a guide, all the way down to the bottom. Gently spread apart the layers of the spiral, then carefully remove from the chopstick. Repeat with remaining potatoes. 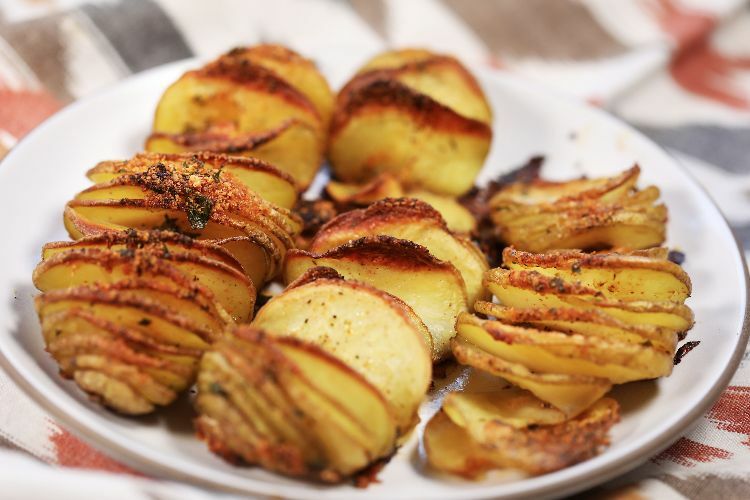 Place potatoes on a baking sheet lined with parchment paper. Brush the melted butter all over potatoes. Season evenly with salt and pepper. In a bowl, mix together Parmesan cheese, garlic powder, onion powder, paprika and parsley. Sprinkle Parmesan mixture over potatoes, making sure to get in between each layer. Bake in oven for 45 minutes, until potatoes are cooked through and crispy on the outside.